Mr. Alexey Eliseev was in the city of Frunze of the Kyrgyz Soviet Socialist Republic (a union republic of the former Union of Soviet Socialist Republics), which later was renamed as Bishkek, but the Kyrgyz SSR became an independent state named the Kyrgyz Republic. In this country he had lived 33 years. There he got higher legal education and had quite successful career, as well as own business. His employment history included work at a legal firm, several banks (inter alia, in executive positions), commercial and industrial companies. Moreover, he was a general representative of the largest lighting equipment (electric-bulb) holding of the Community of Independent States in the Kyrgyz Republic, and also was a member of management of a number of significant manufacturing plants of Kyrgyzstan. In 2002 he passed the qualifying examination, where subsequent to the results the Ministry of Justice of the Kyrgyz Republic granted to him a license No. 00813 for legal practice and advocacy of 30th August 2002. From that moment to the present day (except the period from February to June 2010) he has been a legal practitioner of the Kyrgyz Republic, engaged in rendering qualified legal assistance to natural persons and legal entities on civil, administrative, criminal, corporate and commercial issues, matters and disputes. Moreover, in September 2005 he founded his own law office – Limited Liability Company V.I.P. Consulting. His clientele consisted of private persons, local and foreign investors, Kyrgyz and foreign corporations, public establishments and companies. In February 2008 he, as a professional lawyer, was invited by deputies of one opposition party of Jogorku Kenesh (Parliament) of the Kyrgyz Republic to participate in elections of the Central Elections and Referendums Committee of the Kyrgyz Republic (as one of candidates for the post of a member of CC under the Parliament quota). By Resolution No. 163-IV of Jogorku Kenesh of the Kyrgyz Republic of 14th February 2008 by majority of votes he was elected as a member of CEC. In the Committee he worked up to 4th February 2010, when his powers were prematurely terminated in connection with my designation to a public post (Resolution No. 1657-IV of Jogorku Kenesh of the Kyrgyz Republic of 4th February 2010). Also in February 2008 from Head of Executive Office of the President of the Kyrgyz Republic he received an offer to conduct a legal expertise of agreements passed by the Government to Jogorku Kenesh (Parliament) as regards the largest in Kyrgyzstan gold-mining project Kumtor . Kumtor Gold Deposit (http://www.kumtor.kg) belongs to and is being developed by a Canada – based public company Centerra Gold Inc. (http://www.centerragold.com), which shares are quoted at Stock exchange Market at Toronto (commercial symbol CG:TSE). The deposit has commercial reserves of gold in the amount of 9 466 T ounces, also calculated and pre-evaluated gold reserves for another 5 296 T ounces (data as at the end of 2012). According to the National Statistical Committee of the Kyrgyz Republic the share of Kumtor in GDP of the Kyrgyz Republic for the year of 2012 makes up 5.5 %, but in the aggregate industrial output – 18.9 %. The size of direct receipts from Kumtor Project to the budget of Kyrgyzstan reaches 20 % on the total size of budget receipts. Based on expert opinion of Mr. Eliseev the Committee for International Affairs and Interparliamentary Cooperation of Jogorku Kenesh of the Kyrgyz Republic by its decision of 13th February 2008 forwarded the said agreements for follow-up revision. For the representation of interests of Kyrgyzstan in further negotiations and international arbitrage initiated earlier by Canadian investors, he was appointed as Chairman of the Board of Directors of Open Joint-Stock Company Kyrgyzaltyn, owned by the Government of the Kyrgyz Republic and holding on behalf of Kyrgyzstan shares of a Canada-based public company Centerra Gold Inc. Together with the said Decree No. 88-р of the Government of the Kyrgyz Republic of 13th March 2008 he was included in the Cross-Sectoral Ad Hoc Commission on the Kumtor Project. As a result of his work the Government of Kyrgyzstan managed to improve substantially the state positions in this gold mining project , which was entrenched in Agreement on new conditions as regards the Kumtor Project of 24th April 2009 ratified by Law No. 142 of the Kyrgyz Republic of 30th April 2009. As a result of implementation of the new agreements on Kumtor Project the Kyrgyz Republic received additional payments to budget, assets and release from obligations to the amount of over 5 B U.S. dollars. Inter alia, additional 43 532 615 shares of Company Centerra Gold Inc. were transferred to the Government, whereby increasing the share of Kyrgyzstan in equity of this company from 15.7 % to 33 %. Tax deductions and other current payments from the project to the budget raised from 6 % to 20 % on the gross revenue. Moreover, the Kyrgyz Republic was released from claims to the amount of over 1 B dollars claimed against it at the International Arbitrage and received one-off payments in the amount of over 22 M U.S. dollars. Later on for the purpose of representation of interests of Kyrgyzstan, control over implementation of new agreements, as well as for the project development in general Mr.Eliseev was appointed as a member of the Board of Directors of company Centerra Gold Inc. In July 2009 Aleksei Eliseev participated in a competition for the vacant position of director general of Closed Joint-Stock Company Fund of Development of the Kyrgyz Republic , which was held based on Decree No. 261 of the President of the Kyrgyz Republic of 4th June 2009 . According to the results of the said competition by the Decision No. 1 of the Board of Directors of Fund of Development of the Kyrgyz Republic of 21st July 2009 he was appointed as Director General of the said Fund. As at the time of his appointment to office this organization was not conducting any financial and economic activity. Wherewith, Mr.Eliseev together with his colleagues, appointed managers of Fund of Development, had to organize its work “from the ground up”. According to the results of our activity Fund of Development ensured the preservation of the government assets to the amount of over 300 M U.S. dollars and payment of interest under international loan received by the Kyrgyz Republic from the Russian Federation. Mr.Eliseev with his colleagues also managed to begin the implementation and crediting several national projects, also to earn net profit in the amount of 2 400 000 U.S. dollars. The Board of Directors of the Fund of Development by its decision No. 8 of 6th November 2009 released him from the post of Director General due to transfer to civil service. In connection with transfer of Closed Joint-Stock Company Fund of Development of the Kyrgyz Republic under subordination of a new founded Central Agency of the Kyrgyz Republic for the Development, Investments and Innovations by Decree No. 245 of the President of the Kyrgyz Republic of 29th October 2009 (Exhibit A-013) Mr.Eliseev was appointed as Deputy Director of this Agency. The objectives of foundation and activity of Central Agency of the Kyrgyz Republic for the Development, Investments and Innovations were progressive and served the interests of the state and of the society. According to Paragraph 1 of the Regulations on Central Agency of the Kyrgyz Republic for the Development, Investments and Innovations Central Agency was a public agency intended for the elaboration of policy on the economic development, attraction of investments and introduction of innovations. Over five months of work (November 2009 to April 2010) Mr.Eliseev together with his colleagues executed a considerable number of economic researches, developed many investment programs and implemented several real innovation and investment projects. By Decree No. 310 of the President of the Kyrgyz Republic of 10th December 2009 Mr.Eliseev was also charged with the responsibility of a manager from the Kyrgyz Republic at the European Bank for Reconstruction and Development. In April 2010, following the coup d’etat in Kyrgyzstan, Mr. Eliseev moved to Latvia where he was granted political asylum and founded a consulting company «Central Asia Consulting SIA» (http://cac-lv.com). Whereas his public (state) service was finished with the liquidation of Central Agency of the Kyrgyz Republic for the Development, Investments and Innovations acting on behalf of Minister of Justice Salyanova A. issued an Order No. 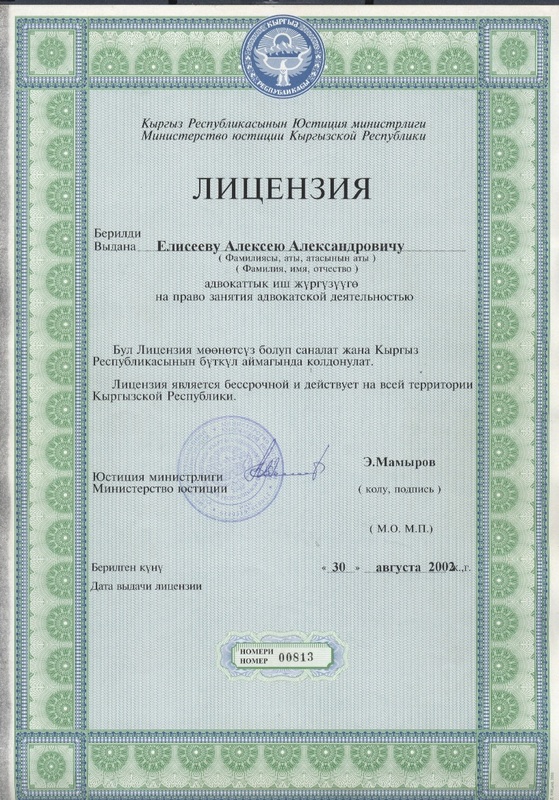 58 dated 28th June 2010 to resume a license of Aleksei Eliseev No. 00813 on 30th August 2002 entitling him to practice as an advocate (lawyer). 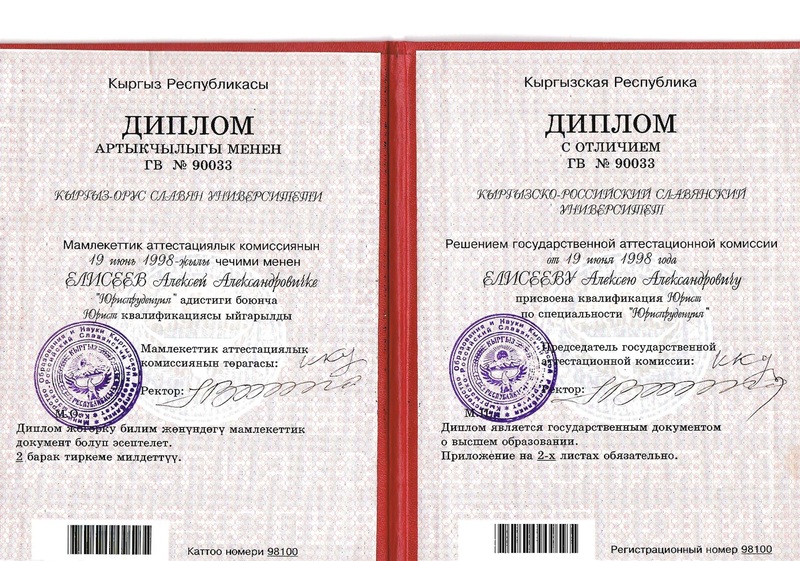 Using this Order the Ministry of Justice of the Kyrgyz Republic returned his name and data to the Kyrgyz State Register of Lawyers (Barristers) — http://minjust.gov.kg/?page_id=1038.